Bill Coyle has been managing our home for us for the past several years. We take great comfort in knowing that our home in Spring Lake is being monitored several times a week in our absence during the winter. Bill also schedules and arranges to have all of our repair and maintenance issues taken care of while we are away. His diligence, attention to detail, frequent communications and trustworthiness truly affords us with "peace of mind" while we are away. In short, he is fantastic. My husband and I have known Bill for approximately two years now. He is currently managing our home in Sea Girt. He checks our home at least two times per week while we are not here... which is always wonderful. He schedules our maintenance calls with local service providers. He is organized and very knowledgeable in the area of home care and maintenance. We would highly recommend him to anyone who is searching for that "perfect person" to watch over their homes as if it were his own. 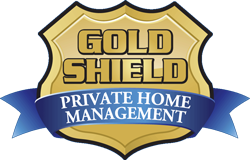 In our dealings with Gold Shield Private Home Management we have found them to be extremely professional and able to deal with all of our requests. We have full confidence in Gold Shield’s experience and ability to manage our property while we remain overseas. Thank you for all that you do and have done for us. Had you not discovered that our heat had been off due to a problem with the thermostat this winter the result could have been disastrous and the damages incalculable. Thank you for a worry free winter.